This Loaded Black on Black 2012 GMC Sierra 2500HD Heavy Duty SLT Extended Cab Short Bed 6.6L V8 Duramax Turbodiesel Puckup Truck is offered to you for sale by Trust Auto. This vehicle is loaded with great features, plus it comes with the CARFAX BuyBack Guarantee. Indulge yourself with one of the most highly crafted, most luxurious automobiles available today. At home in the country and in the city, this 2012 4WD GMC Sierra 2500HD SLT has been wonderfully refined to handle any occasion. Smooth steering, superior acceleration and a supple ride are just a few of its qualities. Added comfort with contemporary style is the leather interior to heighten the quality and craftsmanship for the GMC Sierra 2500HD With all records included, drive away confidently knowing the complete history of this GMC Sierra 2500HD SLT. 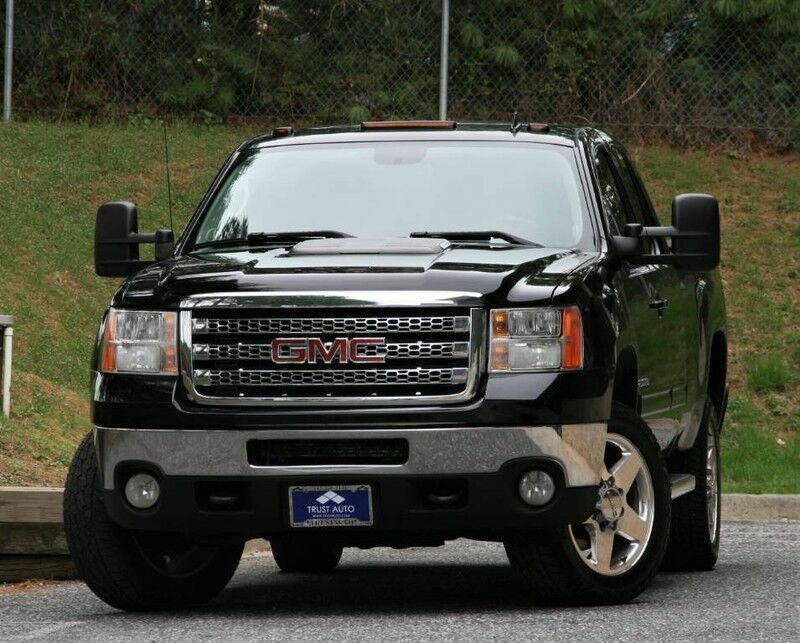 If you are looking for a pre-owned vehicle that looks brand-new, look no further than this Black GMC Sierra 2500HD. Engineered with the latest in technology and features, this vehicle is an automobile lover's dream. More information about the 2012 GMC Sierra 2500HD: The Sierra range continues to be one of GM's biggest sellers. This means the automaker works hard to improve and innovate in truck design. As a result, the consumer wins--whether hauling equipment to a job site, working a farm or towing a boat, the Sierra 2500 and 3500 are built for tough work, and are some of the best-designed trucks available from any manufacturer. Made in either short or long bed form, with 2- or 4-wheel drivetrain, optional dual rear wheels and with a choice of several impressively powerful engines, the Sierra can be set up do just about anything asked of it. The 2500, even simply configured, is capable of towing over 10,000 pounds and base prices start around $29,000. This model sets itself apart with wide variety of configurations, class-leading design, Superior heavy-duty towing and hauling capability, and powerful engine lineup *30 DAYS / 1000 MILES POWER-TRAIN WARRANTY INCLUDED (ENGINE, TRANSMISSION, DIFFERENTIALS)* *TRADE INS ARE WELCOME* Trust Auto is one of the top pre-owned vehicle dealer in Maryland. We provide quality vehicles of various makes and models with the most competitive prices in the region. Trust Auto is dedicated to make your vehicle shopping experience hassle free and straight forward. With that in mind we fully inspect, service and detail all cars in the lot. We are open 6 days a week now FOR YOU!!! Monday - Saturday 9am - 7pm. Some vehicle information and pricing may be unintentionally missing or inaccurate, and Trust Auto will endeavor to correct such discrepancies in a commercially reasonable manner after being notified of any errors. Pricing errors and listing errors are considered invalid and may not be honored at the sole discretion of Trust Auto. Prices subject to change without notice and do not include Title, License, Registration Fees, State or Local Taxes, $895 PDI & $299 Dealer Processing Fees. Please contact seller for vehicle availability. All vehicles with PDI are sold with a 30 day / 1,000 mile warranty! EPA mileage estimates are provided for comparison purposes only. Actual mileage may vary depending on driving conditions, driving habits, and vehicle maintenance. Mileage listings are estimates and are not necessarily accurate odometer readings.